Today’s post comes to us from Shannon Listman from Rowan University. 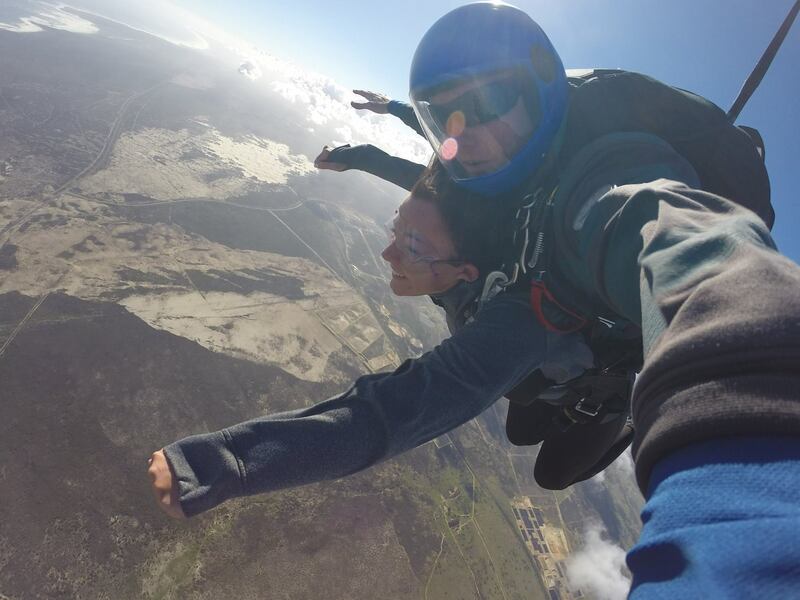 We often say that “life begins at the end of your comfort zone” and it sounds like Shannon really took that to heart during her time in Cape Town. Thanks for sharing, Shannon! Jump out of airplanes, climb one of the world’s wonders, get up close and personal with great white sharks! Cape Town is the adventure capital of the world, what better place to get out of your comfort zone?! I signed up for as many adventures as possible and have loved every second of every one! I wish I could so them all again! Ostrich Burger. Don’t knock it ’til ya try it! There are sooo many delicious meals awaiting in Cape Town. Some of our program’s favorites include Royal Eatery, Mama Africa, Mesopotamia (go the night they have live entertainment! ), and the African Specialty at the Belgian Waterfront Restaurant. Try everything! You’re only here for a short period of time, do everything you can! Make a bucket list and hold yourself to it. I know I wanted to visit some places my friends didn’t. So I found out who wanted to and went with them! If your best friend, your roommates and your new friends don’t want to, I guarantee someone else in the program does too. Find them! You don’t have to hang out with the same group of people everyday. I love the chance to meet new people and find new places! I wanted to take this opportunity to make real connections. I joined the DIRECT trip by myself and didn’t know a single person on the trip. I made so many new friends simply by opening up and talking! Share your life story with someone. Share it with everyone. Opening up to a new group of people can make you feel vulnerable. That’s okay! That’s when you’ll make strong connections. Maybe you came here with your best friend, but maybe you’ll leave here with ten more best friends. I know a bunch of us are already talking about a reunion hike or skydive! We all hate asking “dumb questions.” Most likely someone else has the same question and is also afraid to ask. I have a hard time with this one, but I try to make a good effort to ask. Asking questions gives you answers, but also opens the door for conversation. Ask a Cape Town local about their life. Ask the waitress their favorite food. Ask the bartender their passion. Ask a child from Sir Lowry’s Pass Village their dream. I have had so may valuable conversations with people on this trip just by asking more about them. I’ve also tried a lot of good food and drinks by ordering the waitresses favorite meal! Ask yourself why you signed up for this trip. What did you come here to achieve? How do you want to leave?